Broad beans add color of early summer at a table. It will taste best to boil with salt simply. At first, boil them briefly and prepare your dinner speedy. 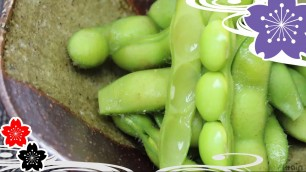 The ingredients are broad beans, salt, and water. Take broad beans out of its pod. Make a notch into the black line of beans to soak salt easily. Add water, much enough to cover the broad beans in a pot. Add 2 teaspoons of salt and turn on the fire. After boiling, add broad beans and let them for 3 minutes. Put it up to a colander and let it cool with fanning by Uchiwa. Put the bright topping. That makes it more vivid. ✍Normally, people peel the skin to eat. However when it is tender, you can eat them with skin. Broad bean is good for preventing fatigue caused by summer heat and has a pain relieving effect. They are full of protein and members of vitamin. So Japanese people often eat them in summer.